WARNING: This is a political book, as if you didn't grasp that by the title. As such, it contains political comments, both from the author and myself as a reviewer of a political work. If you have a problem with that, please just skip this one, okay? It'll save a lot of hurt feelings later. This is a difficult book to review, because it's so politically charged. It is less a story about being Arab in America as it is a story of one man who, after years of being taunted for his nationality, turns very angry and bitter about it and pours that anger and bitterness out on the page. And you know, it's hard to fault him for that. I've not had to deal with being mistaken for the "wrong" kind of person--though my wife has, because of her odd last name. Her 9-11 experience (being challenged for her last name) was completely different from mine (being worried for my aunt). I only get taken for a safe foreigner, and even that only here and there. So I can completely understand why, given an outlet like this book to tell his story, only the negative parts of being an other in an America are shown here. As you watch people who could easily be you get deported, tortured, and stripped of their lives, it probably doesn't incline you to write and draw about any of the people who were nice to you growing up, or stood up for you in class. On the other hand, 117 pages of reading how horrible it is to live in America can be a bit grating after awhile. It's easily to knee-jerk into a reaction of "If you don't like it, go find another country to live in!" (and Mr. El Rassi implies he might just do that by the end) when you're told that no one in America is worth anything because they are all racist assholes. The implication that those who've protested the war or the Patriot Act are all just as bad (or worse!) as the acolytes of Ann Coulter is hard to take and, I think, a bit unfair. But again, if that is how El Rassi feels, he definitely has a right to express it, and I think his manner of doing so is compelling, even if I did find myself wanting to argue his points in several places. The layout of the book, while possibly off-putting to a traditional comic-reader, worked just fine for me. This is not a graphic adaptation of his life nor a depiction of a superhero or mobster or what have you. This is a graphical essay on living in America as a member of a racial minority portrayed as the new evil, now that communism is "vanquished." It only makes sense that it's part text, part drawings, part graphical narrative. I also think that the drawings of famous figures throughout the text was particularly well-done. With rare exceptions, I knew who was speaking without a descriptive tag. That deserves a shout-out and shows that El Rassi has quite a bit of talent in his pen. Where the book breaks down for me is in the tone that all Americans are horrible people. The book has nothing but broken windows, overt or quiet threats, and condescending liberals. At no time is there an acknowledgment that not everyone thinks that way. I find it hard to believe that not even any of El Rassi's friends (regardless of their religion or nationality) are worthy of defense over the course of his life. There are also the factual leaps. The Taliban get a total pass for being horrible to women or other religions, unless it's to point out the US didn't care about it before 9-11. (Intolerance works both ways, and that needs to be acknowledged.) Saddam's invasion of Kuwait is apparently okay as well, as it, too, seems to be defensible because the reaction to it may have been inappropriate. It's also way too easy to blame the entire Israeli-Palestinian conflict on Israel. That's an intellectual shortcut that too many on the left fall into. Arab in America makes a case that we as Americans are happy to have a new enemy and that we don't shy away from portraying Arabs as evil every chance we get, whether its menacing stock footage or racist voice acting/casting. We'll even do it before the facts are known, such as the Oklahoma City bombing. (I think that was true of the Atlanta Olympic Games as well, if I remember correctly.) It's hard to argue with that. The best I can come up with is, "On the other hand, we're like that with everyone!" If that's not a sad commentary on America in the 21st Century, I don't know what is. I posted this on September 11th on purpose. Television will give us waving flags and marching troops and footage of brave men and women. But as I've argued year after year, we're forgetting the point of 9-11 and its aftermath. As New York rebuilds with new baseball stadiums and the news blandly reports Iraqi and American deaths overseas, the problems 9-11 briefly brought to the surface are falling away. Our chance to fix what's broken--our chance to reach out to hurt young men in the same situation as El Rassi, both here and in the rest of the world, are slipping away daily and people with no outlet will turn to violence while insular America plays Call of Duty and cheers every gruesome kill. While I will be the first to say we should not let terror overwhelm America (or anywhere else), we also need to remember that the enemy is not the vague other. It's not all Arabs, or all Muslims (El Rassi correctly points out this is another misconception, that all Arabs are Muslim and vice versa). It's radical people who want to take our freedoms away, whether we live in Pittsburgh or New York or Baghdad. Pat Robertson and Jerry Fallwell are just as bad as any foreign foe. They just look more like we do. We don't win by being the bad guys. We don't win by picking on those who don't look like we do. We win by showing the El Rassi's of the world that we're better than the lowest common denominator. 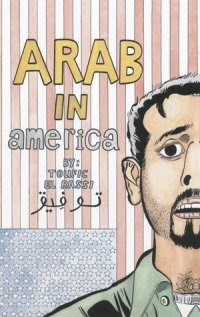 Arab in America is a difficult read, but a necessary one. It forces us to rethink what we say or do or the things we defend. (Take another look at Star Wars through a racial lens this time, particularly the new trilogy.) It forces us to think about what we're saying the next time we let someone lump everyone into a group because it's easier than arguing the point. What we do or don't do can form quite the impression. For El Rassi, it's been a totally negative one. I'd like to think I've done better, but maybe not. How about you? I'm proud of the fact that in the 21st Century, it's not just a book or an essay that can force that kind of soul searching. It's a comic, too.